Over fifty agrodealers from major towns in Siaya County of Western Kenya were recently trained on the 4Rs of fertilizer use during a one day workshop organized by IPNI and the Siaya County Department of Agriculture. 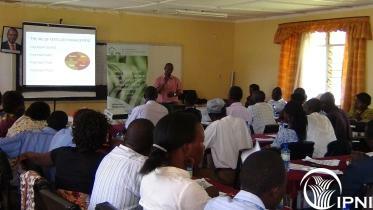 The workshop which was conducted on 3rd December 2013 at the Siaya Agricultural Training Centre was part of activities in the ongoing project on “Promoting 4R nutrient stewardship in Africa". The workshop was organized in conjunction with the Pest Control Products Board (PCPB) which trained agrodealers on the handling and storage of agrochemicals. During the training, agrodealers were taken through an intensive and participatory presentation on the importance of applying the 4Rs during fertilizer use. As part of the presentation, staff from IPNI presented data and photos from ongoing demo sites to illustrate each of the 4Rs and the need for balanced nutrition. During the training, staff from IPNI emphasized the important role that agrodealers play in the agricultural chain as they form the main point of contact between the farmer and the fertilizer industry. Agrodealers were therefore urged to pass on the knowledge gained from the training to farmers during their day to day interactions.